As some of you may know, I create so called "Collectible Cards" for the Osa-P shop here on GC, which can be found and purchased in the Silver Millennium Emporium. However, thinking of new cards, their color-schemes (styles in general) and different characters, can sometimes be a little tough for Ally-Cat <.<. That's why I thought of creating a general Suggestions/Ideas Thread, in order to collect as many ideas as possible! Literally everything can be suggested; sometimes I don't do well enough on thinking about possible ways regarding the creation of new cards, which means you can even suggest the layout and the color-scheme(s) of each set! (which is highly appreciated of course ). Please also be aware that not everything will make it's way right away into Silver Millennium Emporium! 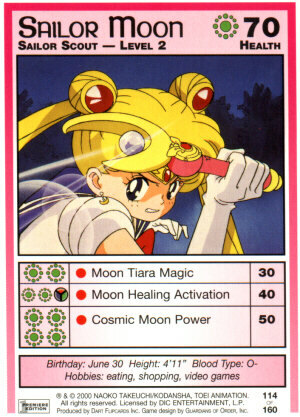 My current thoughts/suggestions of new sets would either be every Solar System Senshi, their Transformations/Attacks, or Couples? Locations/Scenery (such as Crystal Tokyo, Elysion)? 5 cards (containing various kinds of pictures of character(s), object(s), location(s) etc. How about artbook cards? Like there could be a series of selected images from each art book? I have various sites where the scans are readily available. I also second the couples and attacks/transformation ones! 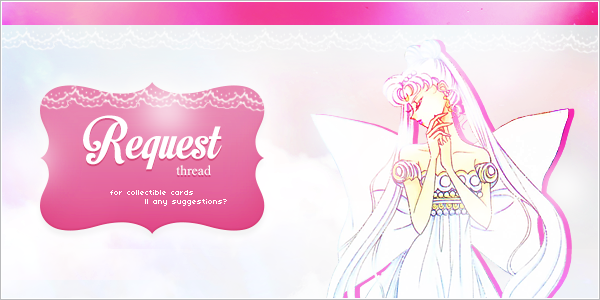 Admin Note: The Collectible Card Set which is dedicated to Luna (the character), has been officially added to the Silver Millenium Emporium, as well as crossed out from the pending requests list (sorry for the delay ;_; ). That Luna collection is amazing ! Diana ,you've outdone yourself this time ! And since we have a Luna collection why not an Artemis one too ? Yep! Totally! I was going to complete the cat-series either way so XD. I'll add Artemis and Diana as well. A new set has been published; 5 XXL Cards + one Special Stamp including various Artbook Scans, can now be purchased in the Silver Millennium Emporium! This set is completely different in comparison to the previous sets :3. And this is only the anime that I can think of off the top of my head right now. I'll add more if need be, and make a manga one once these ideas are either greenlit or passed by. *lol* thanks, Ju! I totally forgot about the fact that I can now create cards from various animes and mangas. Thanks for the massive suggestion-list, Cosmos! Suggetions of color-schemes, characters, items, details etc. are more than appreciated!! New 'Mini-Set' available to purchase in the Silver Millennium Emporium! I have finally added the category 'Locations' by starting off with the beautiful Crystal Forest/Elysion. More location sets will follow upon request! A new 'card-design' was used for the location category, hence no username needs to be added on each card for this collection. I also reduced the amount of cards from 10 to 6. YESSSS locations!!! What a fabulous idea! :0 The Elysion design is super cute~. Update: New set available to purchase! Since the Cherry Blossom Festival is approaching, I decided to create a corresponding set for it AND A NEW CATEGORY: Events. But not in terms of GC events (as I will be doing seperate sets) but in terms of events that occured in the anime itself. Are you still looking for suggestions, Diana? Or are there enough to go off of for now? I could always come up with more themes if you need them.